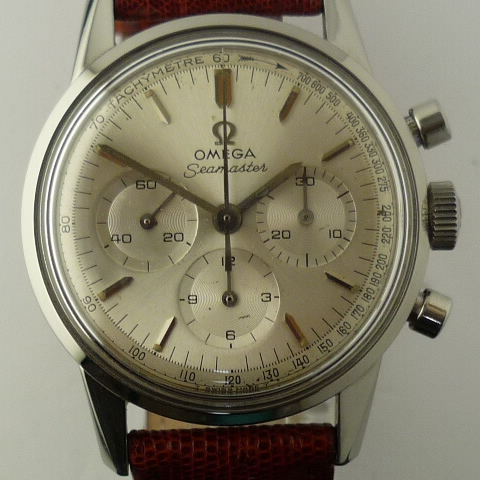 Omega Seamaster Chronograph Ref: CK2947/2 "1950s"
This 12 hour recording chronograph made in the mid to late 1950's is in excellent condition for its age and is a collectable item. The watch is all original and has been serviced in our own workshop. The Calibre 321 is free of rust and is in perfect working order. The case is stainless steel, this does show signs of its age but overal lit is in really good condition, free of dents and scratches. The watch comes ready to wear on a leather strap. Navigator: Gallery» Omega » Omega Seamaster Chronograph Ref: CK2947/2 "1950s"